Doughnuts. The answer has been there all along. Why suffer through the same holiday dessert routine, year after year? Why subject yourself to the same selection of simple sweets, when you can offer something daring and delicious? 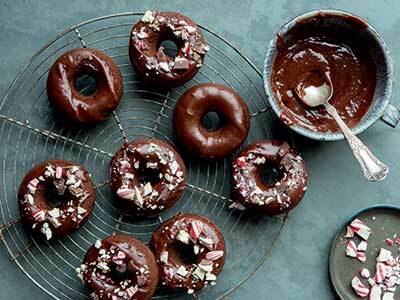 Break the norm and leave a lasting impression with these Peppermint Bark Chocolate Doughnuts, perfect for any holiday dessert menu. From The Doughnut Cookbook. Fill a small saucepan with 2 inches of water and bring to a gentle simmer over low heat. Place a medium bowl over but not touching the water. In the bowl, combine the hot water, chocolate, vanilla, confectioners’ sugar, butter, and salt. (Reduce the amount of water for a thicker glaze.) Cook, stirring occasionally, until the chocolate and butter are melted, 2–3 minutes. Remove from the heat and stir until smooth and well blended. Cover the bowl with plastic wrap to keep warm until the doughnuts are ready to glaze, or cover and refrigerate for up to 3 days. Gently reheat in the bowl over the saucepan or in a microwave-safe bowl in the microwave for 20–30 seconds before using. Preheat the oven to 375°F. Coat the wells of a doughnut pan with nonstick cooking spray. In the bowl of a stand mixer fitted with the paddle attachment, beat together the butter and sugar on medium speed until light and fluffy, about 2 minutes. Scrape down the sides of the bowl. Add the egg and vanilla and beat on medium speed until combined, about 1 minute. On low speed, add the flour mixture in 3 additions, alternating with the milk mixture and beginning and ending with the flour. Beat each addition until just blended. Pour 2 tablespoons batter into each prepared well. Bake, rotating the pan 180 degrees halfway through baking, until a toothpick inserted into the doughnuts comes out clean, about 10 minutes. Let cool in the pan on a cooling rack for 5 minutes, then invert the doughnuts onto the rack and let cool completely. Meanwhile, wash and dry the pan and repeat to bake the remaining batter. Dip the doughnuts, top side down, into the glaze, sprinkle with the peppermint bark, and serve. 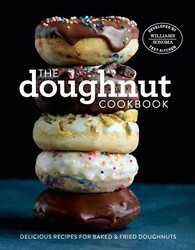 The Doughnut Cookbook, the next book in the Williams-Sonoma Test Kitchen series, is a compact yet comprehensive guide to making doughnuts. Ranging from classic Old-Fashioned style doughnuts, to lemony-glazed baked doughnuts topped with pistachios, and sugar-dusted beignets, this book includes something for all doughnut-lovers. Yeasted, fried, baked, glazed, and sprinkled, doughnuts are enjoyed in all different shapes and sizes. Learn how easy making doughnuts at home is in this all-inclusive guide from the Williams-Sonoma Test Kitchen. Inside these pages, you'll find recipes for basic doughs and glazes, mouthwatering recipes for classic and innovative doughnuts, tips and tricks for frying and baking doughnuts, and much more. For first time doughnut makers to the moderately skilled, and those who want access to a diverse combination of recipes that everyone will love, The Doughnut Cookbook is for you.